IN THE TENTH ROUND OF THE WORLD SBK CHAMPIONSHIP IT’S A DOUBLE ONE-TWO FOR THE ITALIAN BIKES ON THE SPANISH TRACK. MARCO MELANDRI WINS BOTH RACES IN FRONT OF TEAM MATE GUINTOLI. 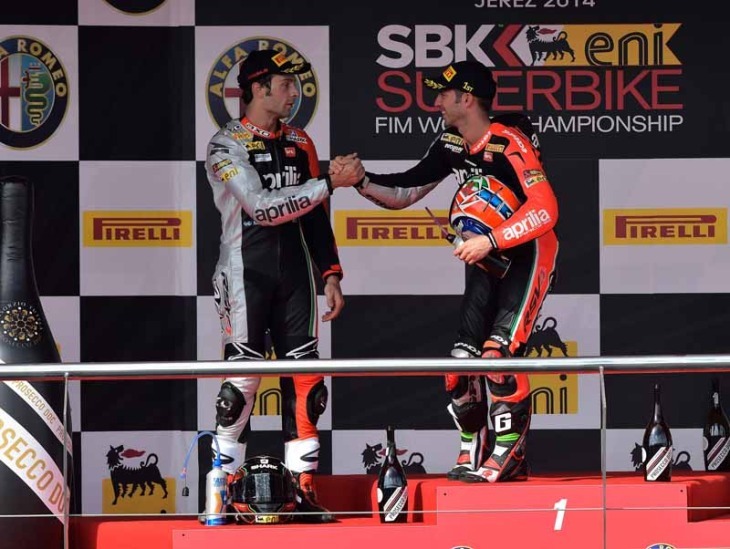 Jerez de la Frontera, 7 September 2014 – Aprilia had no rivals at Jerez in the tenth round of the World SBK Championship. The RSV4s from Noale proved their superiority taking first and second place in both Race 1 and Race 2. In both races Sylvain Guintoli took the lead early, trying to pull away from his rivals. Once overtaken by Melandri Guintoli confidently managed his position, finishing in second place twice to earn 13 championship points and close the gap behind championship leader, Sykes, whose advantage has now been reduced to just 31 points over Aprilia Racing’s Frenchman. Davies and the Ducati Superbike Team back on the podium in SBK race 1 at Jerez!